If there's one thing Caiques love to do, it's play. For their size, Caiques play harder, longer and more roughly than most other birds of similar size. Playing is not only good for them physically, it is also an essential part of their mental stimulation. 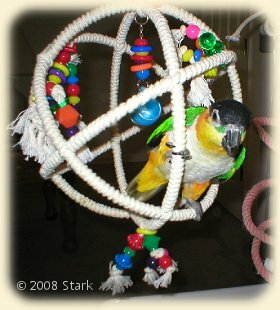 Because of this, they will need toys designed for better wear than toys designed for Conures or similar sized birds. Toys made of acrylic or plastic will last a long time, however, shreddable or chewable toys are also needed to keep their beaks in good condition and satisfy their need to chew. Safe woods such as pine, fir, aspen, apple, willow, birch and many others, ropes made of digestable materials (cotton, sisal, etc) and leather all make excellent toys for chewing. These toys may be solidly mounted or hanging style toys (see below for safety concerns with hanging toys). Unlike many parrots, Caiques really enjoy lying on their backs when they play, so small toys which can be held in their feet ("foot toys") are a big favorite. Foot toys can be purchased from vendors, or simply made from the remains of older toys which have been largely destroyed simply be removing whatever existing parts of the toy remain. Balls, small pieces of wood or cholla, and some baby teething toys all make excellent foot toys. Stainless steel buckets can be purchased and kept inside the cage to keep the foot toys contained in one location. 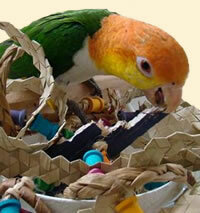 Toys for Caiques (and most other birds) should contain a variety of textures, consistencies, colors, sizes and shapes. 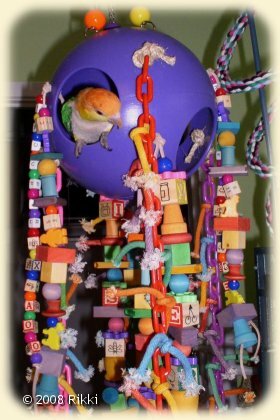 Caiques are very mentally active birds, and enjoy variety in their toys. While they may have a favorite toy one week, they can quickly become bored with it by the following week. It is recommended that toys be rotated about once per week or every other week. Much like we become so accustomed to our furniture being in the same location, having the same toy in the same place at all times will eventually lead to the bird no longer noticing it. 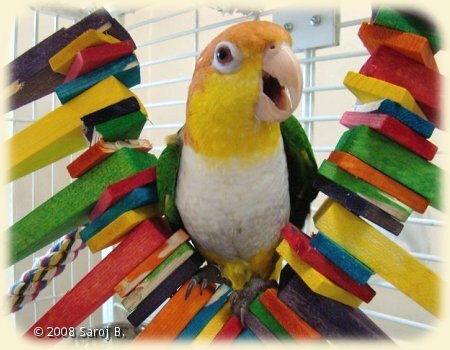 If your bird has certain types of toys it really enjoys, more than one variety of that toy may be purchased so that they still have the functionality without becoming bored. For instance, many types of swings are available, from rope covered to wood to beaded. If your bird happens to really enjoy swings, having two or three different swings which you can rotate through the cage in different locations may be a good idea. Since Caiques are so active with their toys, safety must be taken especially seriously. 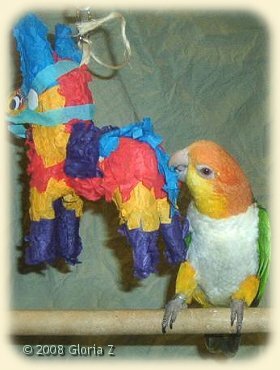 The danger of entanglement and death are very real with Caiques. Most of the time, entanglement issues occur with hanging toys. A toy hanging from a chain must have links either so small that the bird's toe can not fit into the link, or large enough that the bird can pass it's entire body through the link. Hanging toys on ropes, leather thongs or twine must have no more exposed length than can wrap around an average person's thumb. If it can wrap around a thumb more than once, it's too long and the bird can hang itself in it (you can shorten some by either tying knots in the rope/twine or by tying other toy items into the exposed part). Rope covered toys and perches (such as soft perches, boings or rope covered swings) should be inspected for frays in the material which can wrap around a bird's toe. More than one bird has lost toes to these kind of entanglements. The attachment for the toy must also be taken into consideration. Split ring attachment hardware (like a key-ring) pose a threat to beaks, as the birds can pry open the ring, then get it stuck or work it through the beak itself. Similarly, carabiner type attachments can also entrap then mutilate beaks. The safest attachments are pear attachments or C-clasps. Both of these pieces of hardware have threaded screw-type closures on them making beak pinching or entrapment significantly less likely to happen. While most toy safety concerns involve rope/chain/twine, some foot toys can also pose choking hazards. 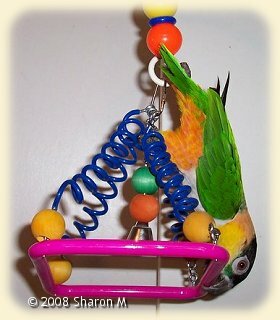 Many foot toys for smaller beaks come with small plastic beads or other small plastic pieces on them which a Caique can easily break off and swallow or choke on. Remember that while your Caique comes in a small body, they play with a big beak. 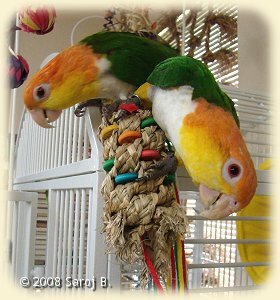 Some bells (like jingle bells) have slits in them which Caiques can get their tongues stuck inside. Any non-natural part of a toy which can be bitten or chewed off is a potential choking hazard or a potential intestinal blockage waiting to happen. We strongly encourage creativity in toys. Many people take kebabs (sold as foraging toys for food normally) and use the stainless steel rod to thread bits of other toys in. Don't be afraid to recycle the remains of old toys and turn them into new ones. As long as safety concerns are taken into account, many toys will last through several different stages of play. Remember: a destroyed toy is an enjoyed toy! Next: Caique Breeder's Brag Book!